Long gone are the days when Singapore’s drinks scene was solely defined by its saccharine Singapore Sling. Today, the local cocktail industry has exploded in epic proportions, and counts a number of its bars amongst the World’s 50 Best Bars — just today, news broke that two were announced in the top ten of the annual awards, with three others following closely behind. Keep reading to know which watering holes nabbed the prestigious titles, and find our picks of the 10 best Singapore cocktail bars. Number three on the World’s Best Bar List of 2018, Manhattan also ranks first on Asia’s Best Bar of the year. As the name suggests, the bar is an homage to New York City in the 19th century and is inspired by the Golden Age of cocktails. Come here to drink the classics. The bar’s star cocktail shares its name; the Manhattan mixes Michter’s US1 Straight Rye whisky, which comes straight from the bar’s — and the world’s first in-hotel — rickhouse which stores aged spirits, bitters and cocktails. Herbs, spices and roots are fermented, dried, pickled and brined in the Ingredients Room. Libations come in a variety, ranging from artisanal spirits to craft cocktails. If you’re upgrade your mid-morning weekend routine, Manhattan offers an adults-only brunch of unlimited craft cocktails, boozy milkshakes, dark rum or maple-finished bourbons to be downed with freshly shucked oysters and enjoyed with Maine lobsters and hand-rolled bagels. An unassuming nook at Amara Singapore hides a luxurious secret: The new, two-storey space of Jigger & Pony. A household name in the local cocktail scene, the bar retains its iconic mahogany colour palette from its original home in Amoy Street, contrasted with velvet emerald armchairs. While still distinctly buzzy, the new space offers visitors a chance for cosier get-togethers, with booths for small groups and a mezzanine level that’s a hot favourite for birthday celebrations. Like the interiors, the menu is a deft depiction of the bar’s revamp. It’s written like a magazine, with columns and guest articles, although a quick flip to the back delivers a straightforward list of drinks in order of potency. 27 cocktails are available, with new Asian classics such as the new Java Cooler, which combines sesame-infused Tanqueray Dry Gin, calamansi and pink tonic, or the updated Singapore Sling, which features smoky lapsang souchong for a smoky flavour and rhubab for tartness. If a bar has you (willingly) drinking ants, it’s got something good going. The wildly inventive cocktail in question is Native’s Antz, and has the insect as a garnish atop a frozen basil leaf and a concoction of salt-baked tapioca, homemade coconut yogurt, aged sugarcane, and Chalong Bay rum. Native (2018’s 13th best bar in the World’s 50 Best Bars list) ditches the concept of the American speakeasy by focusing on regional produce. Founder Vijay Mudaliar is an active forager who’s devoted to hunting for wild ingredients. Tipples are packed with bold ingredients that are fermented, distilled and treated in-house, and range from Malaysian hibiscus flowers to dehydrated Laksa leaves and Gondhoraj Lebu: A kaffir lime found only in Bengal. Operation Dagger is the prototype of local speakeasies. Hidden in the basement of Ann Siang Hill, getting to it requires traversing a stairway behind a nondescript glass door marked by a tiny logo. Entering the bar is much like chancing upon a mysterious apothecary. Decked in raw concrete and wooden furnishings, the space has, at its center, a light installation of industrial-style exposed lightbulbs; behind the bar, sits unmarked, identical laboratory-style bottles. Its cocktail menu is notches above on the inventive scale; the Moscow Mule, for instance, is made with fermented rye, blackberries, honey, and topped with coriander snow. Step through the resplendent bronze and granite facade of Parkview Square and you’ll find yourself in the grandiose lobby where Atlas sits. 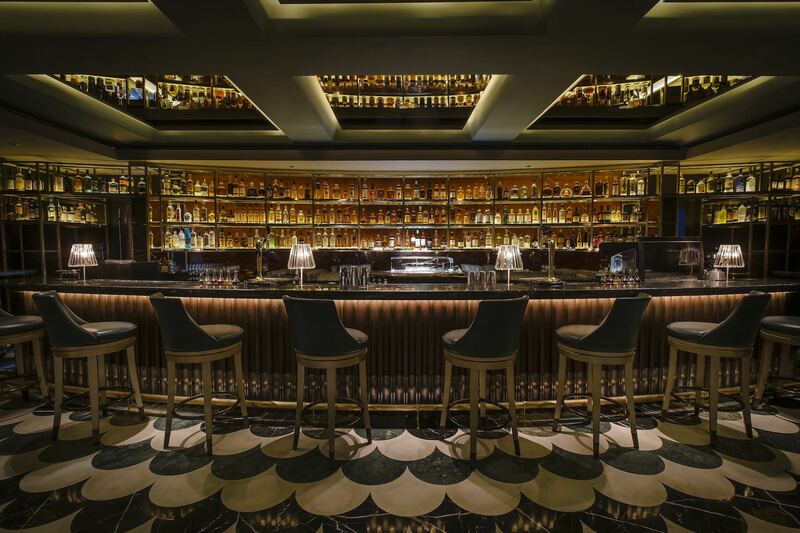 Furnished in a gilded Art Deco style complete with a towering baroque ceiling, the bar (which ranks eight in this year’s World’s 50 Best Bars) boasts a three-storey high liquor cabinet boasting an ambitious range of gin; some even date back to a thousand years ago. A gin and tonic is clearly a must here, with some infused with red peppercorn, cold brew coffee and the bar’s exclusive East Imperial Atlas tonic water. Other cocktails on the menu are formidable reiterations of libations of the past, such as The Formidable Negroni, which reportedly dates back to as long ago as 1919. 28 HongKong Street is as indiscernible as it gets; it has no social media presence, and patrons are forbidden from taking photographs. Its blink-and-miss entrance with no visible signage masks a secret underground world — a small but sophisticated speakeasy serving quality cocktails for the most discerning of guzzlers. Crowd favourite cocktails include the 93 ’til Infinity: A fresh concoction of Encanto Pisco with pineapple, lime and cypress with a dehydrated pineapple chip served on the side. Few renowned bars can lay to claim to also being part of an equally excellent. Cocktails aren’t simply shaken and stirred here; classics aside, its special cocktail menu is called Dreams and Desires: a 12-cocktail range that spans contrasting flavour formulas. Prior to ordering, you get to sample each of them in the form of rainbow gummy bears. Last on the list its most interesting creation: Supercar combines ‘petrol’ (or rather, a compound of it that gives truffle oils its overpowering scent), butter, white wine, gin and citrus. Smoke & Mirrors is a destination bar; perched atop the National Gallery Singapore, it rewards visitors with sweeping tourist-pleasing views. Imbibe cocktails from its Playful Eye cocktail menu, which features top-shelf spirits with quality bartending techniques. Fans of savoury and tangy notes will enjoy the umami flavour of the Kurokawa, which brings together Kombu vodka, shaken with gomasio (black sesame and sea salt), infused with ponzu for acidity, and served with micro tomatoes and sea grapes for a touch of tartness. Brought to you by the same folks behind its original New York City locale, Employees Only has become a cocktail institution since its opening two years ago. The bar has a regular and devoted clientele, of which it has its primary tenet to thank of good cocktails and good food. Tucked away in a backalley behind a fortune teller’s booth, the bar exudes a distinct Prohibition era vibe with its Art Deco accents and low-lit space. Its menu packs a punch for all sorts of cocktail drinkers. This Ann Siang Hill nook does a commendable job of paying tribute to Singapore’s heritage and history. Taking inspiration from William Farquhar’s Natural History Drawings book, the bar shapes its cocktail menu according to common herbs, fruits, spices and flora into its drinks. Those who love a tropical twist in their drinks are well-suited for the King & Queen, which juxtaposes the sweetness of the mangosteen and fragrance of pandan with the smokiness and bitterness of coffee beans. A tiny dollop of durian leaves the drink with a creamy, decadent and mildly pungent touch. Another local favourite is the Galangal Beer, which mixes the root infused in vodka, spiced pear syrup, fresh lime and house galangal ginger beer. Nafeesa covers a spectrum of beats, notably beauty, travel, and fashion. She constantly has an unpacked suitcase for her next adventure and five lipsticks to keep her prepped for industry events. When not writing, she enjoys sipping coffee or cocktails — sometimes simultaneously. Sign up for our newsletter to receive the latest food and drink news and reviews.